In ancient Greece, plays were performed in amphitheaters that sometimes seated as many as 25,000 people. Actors, without the benefit of microphones, had to perform in a declamatory style that would seem unnatural to modern audiences. Throughout the history of drama, the architecture of stages has influenced the style of drama and vice versa. Today, there are four basic types of theater stages. The most traditional type of stage for live theater is the proscenium, in which the audience sits in rows facing the stage. The proscenium itself is the wall that separates the stage from the auditorium--where the audience sits--and looks much like a picture frame around the playing area. Some proscenium stages are "raked," meaning the surface is slanted at an angle to provide the audience with a better view of the "upstage" area--the area furthest away from the audience. 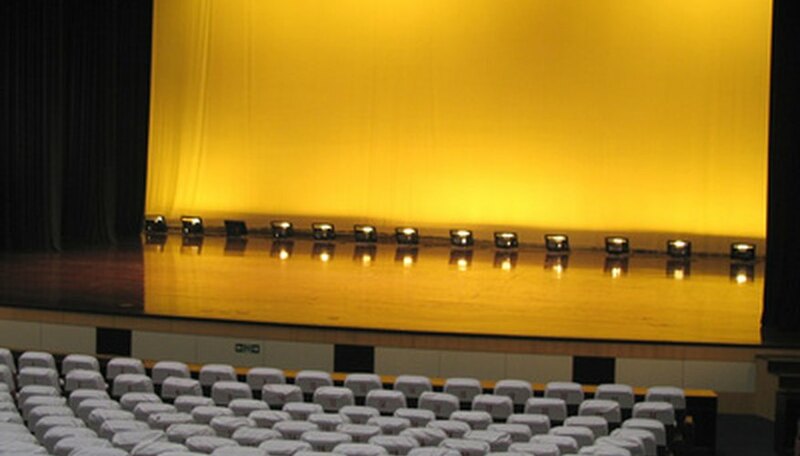 Proscenium stages are ideal for realistic acting and production styles. The "wing" areas to the left and right of the stage, as well as the "fly loft"--the space above the stage--are masked by the proscenium wall. In many productions, entire sets are concealed in these areas so stagehands can completely change the stage set between scenes, creating the realistic illusion of a different place for the next scene. In this type of space, the audience completely surrounds the playing area. Whether a square, circle or rectangle, this type of stage places the audience in close proximity to the playing area. Also known as theater-in-the-round, this type of staging is similar to the style used in Medieval times, where a platform was essentially plopped down in the middle of an outdoor marketplace. Scenery must be minimal so as not to block the actors from the surrounding audience, although lighting changes can create the illusion of time passing between scenes. Directors must carefully guide the actors' placement so that, throughout the play, they face audience members on every side and don't leave a particular section feeling neglected. This type of stage is ideally suited for plays in which an intimate feel is required or the actors interact directly with the audience, as often happened in Medieval plays. In this arrangement, the audience sits on three sides of a rectangular stage that literally "thrusts" into the seating area. A thrust stage may or may not be connected to a larger, proscenium stage. During the Restoration in the17th and 18th centuries, most stages were a combination of proscenium and thrust, with elaborate scenery that did not aim for realism but presented an idealized vision of grandeur. Because both the actors and audience were fully illuminated during a performance, it was more difficult to create the illusion of a separate world on the stage in Restoration times, although this illusion can now be created with modern lighting. Thrust stages allow for realistic productions that subtly draw the audience into the world of the play as the actors move onto, and off of, the thrust space. As the name implies, a flexible stage can take many shapes and forms, incorporating elements of thrust, arena or proscenium stages. Some theater spaces are designed so the stage can be altered during the course of the performance. Flexible stages allow for a stylized realism in which the illusion of different places is created from scene to scene by shifting the playing space rather than moving scenery on and off the stage. Today's productions of ancient Greek or Shakespearean plays often try to "modernize" the material with present-day costuming and naturalistic acting. Flexible stages can help with such productions, bringing what may seem to be overly lofty material down to a more accessible level, physically as well as artistically.